Some mirth and dis-belief have been expressed when this topic has been discussed on bulletin boards and Email message groups, but there is a serious side to this device... Mainly establishing the numbers of bees that die within the hive so that comparisons can be made on the possible damage to bees from agricultural spraying operations. It is intended that the links at top left will carry the details of the individual types of trap that are mentioned in published papers, however information in any detail is rather thin on the ground and to this end I ask that if any of you have any details on any of the traps that are mentioned (or any other), then I would be pleased to receive them in order to include in these pages (full recognition of source will be given). Reliability of data that is gathered using dead bee traps, is also difficult to establish as the bees themselves are generally good at removing corpses from the hive. Wasps, hornets and other predators can also modify the figures by cutting up dead bees and removing the portions for their brood to eat. In fact this problem of reliability is so great that much of the published work is actually about the differences in performance of the traps rather than how they work or how they have been used. The text quoted below has been recovered from several different translations and reassembled to make sense in English. It refers to experiments carried out in Udine (Northern Italy) by M. Greatti, R. Barbattini, M. D'Agaro and F. Nazzi during the period 27 May 1992 - 26 August 1992. To verify the effect of time on the efficiency of three different models of dead bee trap (Todd, Gary and under basket) in collecting dead honey bees. Three groups of five adjacent hives were used for this experiment. Each group of five was fitted out with dead bee traps of one of the three designs. Into each hive, fifty dead honey bees were marked and introduced into each hive, twice a week. Recordings of counts were made at intervals of 30 minutes, 1 hour and 7 hours after the introductions of dead bees. The dead bees recovered inside the traps were removed at each count. For each model of trap about 80% of the total number of marked, dead bees had already been recovered 30 minutes after introduction. Time seemed to have an important effect on the efficiency of Todd and Gary traps, whereas the efficiency of under basket traps was not influenced. The results obtained in the experiment suggest that under basket traps be used in trials where traps for collecting dead honey bees are employed for long periods of time furthermore they do not interfere with the normal activities of the colonies. Many years ago (after an episode of spray poisoning) I cobbled together a dead bee trap myself. I cannot say that a great deal of thought went into it and some of the details may not be perfectly remembered. It was totally un-calibrated as far as effectiveness or losses of dead bees was concerned, but overnight counts gave consistent results of 4, 5 or 6 corpses. I no longer have the device itself, which was constructed from some scribble on the back of an old envelope and it was made quickly from materials that were to hand at the time. It worked by splitting the incoming bees and out going bees.The whole device was intended to replace a normal hive floor, no provision being made for inspection or counting the collected dead bees, the whole unit was removed for counting. The entrance was formed from three parallel sheets of 6 mm ply with 9 mm bee spaces between them the spaces between them being maintained by softwood strips 9 mm x 9 mm. The upper set of slots was "incoming" and was fitted with a dozen or so porter escapes arranged to allow bees in, but not out. The topmost and lowest sheet of ply were level with the hive front and the middle one protruded 50 mm forwards and formed an alighting board. The outgoing slots were underneath this protruding entrance and were painted with matte black "blackboard" paint. The device worked as all bees arriving back from foraging were descending and landed on the projecting "shelf". Any orienting bee on its first flight would rise about 150 mm before taking it's first "fix" and so would return to the top slot. The projecting alighting board hid the bottom slot from sight. The drawing is a little out of scale, the drilled sheet has been shown as transparent for clarity, but was in fact an opaque cream colour. In a study the efficiency of dead bee traps by Ingrid Illies, Werner Mühlena, Gerti Dücker and Norbert Sachser... Several types of trap were used to evaluate mortality in bee colonies. The influence of different designs of dead bee trap on the undertaking behaviour of honey bees was tested in twelve colonies of Italians Apis mellifera ligustica. Four types of dead bee traps... Original Gary Trap, Modified Gary Trap, the IPSAB Trap and Muenster Trap were compared to control colonies without a trap. The use of different bee traps led to incomparable results. With the original Gary trap, many stray bees were trapped and eventually died in the glass collecting jars, leading to an artificially high record of mortality. Bees removed some of the dead bees from the modified Gary trap, especially during good flight conditions. Dead bees disappeared from the IPSAB trap because of predators and wind. Both types of Gary trap had a negative effect on undertaking behaviour. The number of behavioural traits involved in removing a dead bee from the colony is large and thus, undertaking takes a long time. In the IPSAB trap, the undertaker bees showed the same number of behavioural traits and took similar times to remove dead bees as the control colonies without traps. 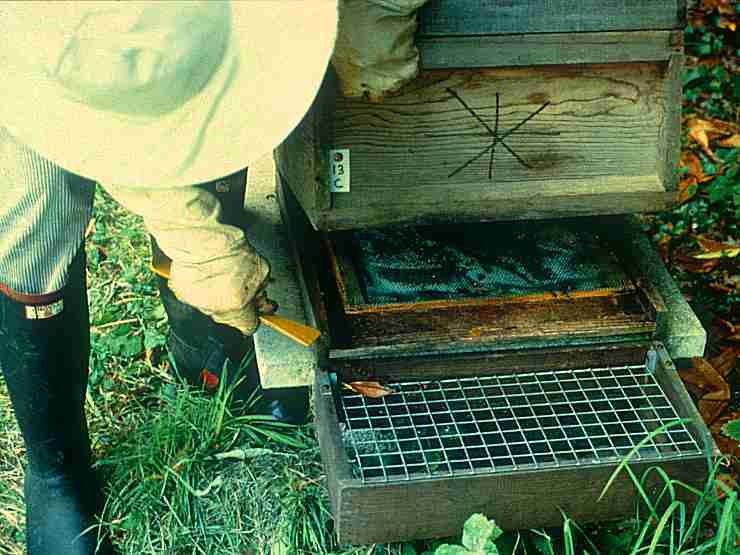 The Muenster trap, equipped with an easily accessible hive entrance, a collecting box for dead bees and an outlet for stray bees, gave a significantly improved performance. During field studies in the South West of England carried out by Brenda Ball of Rothamsted Research, around 1993, a representative sample of dead bees were collected on a monthly basis for virus analysis, along with mites from March to the following April. The method used was simple... A box of the same length as the width of the hive and about 200 mm wide was placed in front of the hive entrance the box has a mesh floor, to avoid decay of corpses, with a grid of about 25 mm mesh placed on top to stop the collected dead bees being eaten by birds. This only collects those bees that were dropped over the box of tossed over the edge of the entrance. However if numbers are important, the number retained depends very much on the time of year. In heavy rain everything gets smashed to bits and washed through the bottom. Alternatively, in late summer wasps will chop up all the bees and take the juicy bits, so all you get is a collection of heads, wings and abdomens. Also, some bee colonies will diligently go to a lot of trouble to drag all the bodies out and fly off with them, whilst others won't bother. Some sort of rough and ready calibration could be made as I think that the area of the box would relate to a fraction of the total bees removed by undertakers, but the problems of degradation and removal would render this method unsuitable if precision in numbers was required.